There is a strong challenge inherent in any attempt to describe a great and influential personality like Yunus Emre in a condensed form such as this. We will, therefore only make an attempt to give an introduction to the man and his philosophy which will tempt you into further reading. Wherever possible we will allow Yunus to speak for himself. Yunus Emre was a great folk poet, a sufi (Islamic mystic), a troubadour and a very influential philosopher who had an effect on the Turkish outlook on life that has stayed alive and vital for 700 years. Above all, and in an age of religious repression, he was a humanist who’s love for God was integral to his love for humanity. His abhorrence for conflict and his dismissive attitude to riches and material assets have been echoed through the ages, not least in the ’flower power’ era of the 1960s and 70s. Yunus Emre was more concerned with the reason for living than with the details of how life should be lived. Essentially he thought that people should live modest lives filled with love and friendship, aspiring towards spiritual purity and an indivisible unity with God. He despised the pursuit of fame and riches because none of these could mean anything after death. Death is a recurring theme in his poetry but without morbid overtones. He wants us to accept that death is inevitable, so that we don’t squander our time on earth, but also to realize that death is not the end of the road. For each of us death will demonstrate the futility both of pursuing riches and of filling life with hatred, war and grudges. Our only worthwhile legacy is the product of a life filled with friendship and love. Yunus Emre was the epitome of tolerance in a world dominated, from East and West, by fanaticism and by the idea that human beings are born in sin and have to spend their lives trying to rise above their base natures. According to the traditional outlook the only path to redemption is a difficult one, narrow and dangerous, and can only be negotiated with the help of qualified guides, the leaders of organized religions. Most religions, moreover, insist that their path is the only possible route to heaven and that the followers of other paths, no matter how well intentioned, are destined for the other place. Yunus Emre rejected this single path approach. His beliefs were rooted in religion, and he was undeniably an Islamic sufi, but his philosophy was independent and he taught that every belief and every idea, religious or otherwise, that leads to the creator is sacred. Yunus Emre’s idea of God (the 'Friend' of his poetry) is that God is everywhere and within each of us. The love of humanity and the love of God are therefore indivisible. In his poems Yunus Emre shows himself to be a humane, sensitive and modest person firmly grounded. His poems were, and remain, great because he uses language beautifully but simply, his images are rich but extremely clear. 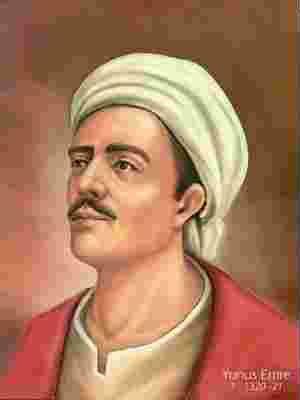 Yunus Emre wrote in Turkish and his words can be read today in the original with very little difficulty. That is one reason why his influence has remained so strong, his work is accessible to ordinary people, appreciated and kept alive by them. His hymns are still being sung, and his words quoted, by thousands of people in Turkey today while his popularity is growing world wide. He was a contemporary of Rumi, who lived in the same region. Rumi composed his collection of stories and songs for a well-educated urban circle of Sufis, writing primarily in the literary language of Persian. Yunus Emre, on the other hand, traveled and taught among the rural poor, singing his songs in the Turkish language of the common people. A story is told of a meeting between the two great souls: Rumi asked Yunus Emre what he thought of his great work the Mathnawi. Yunus Emre said, "Excellent, excellent! But I would have done it differently." Surprised, Rumi asked how. 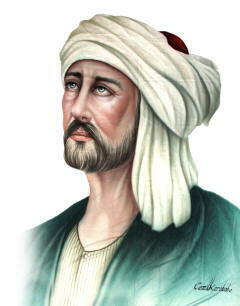 Yunus replied, "I would have written, 'I came from the eternal, clothed myself in flesh, and took the name Yunus.'" That story perfectly illustrates Yunus Emre's simple, direct approach that has made him so beloved. Interestingly, the name Yunus means "dolphin" in Turkish.